Finished! Check them out! I’m naming the sock pattern Poseidon because of the lace wave pattern. You’ll find the pattern in the column on the right. Up next? 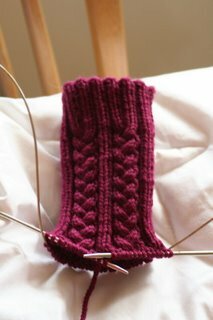 Some cabled socks using Knit Picks Swish Superwash in Bordeaux. I’m pleased to report that Swish is wonderful to knit with – a nice change from Essential. Stay tuned for more socks! 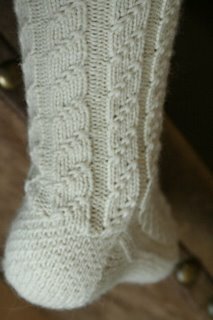 I used Knit Picks Essential sock yarn for this one. You can’t really argue with KP prices but I find the quality lacking with this particular line. The yarn is awfully splitty. The fabric feels nice but I didn’t really enjoy knitting with Essential. Unfortunately, I have four more balls to use – two in dark green and two in burgundy. My other complaint about Essential is that the color, Gulfstream, looks electric blue on the website but when it arrived, it looked more blue-green. I was going for the electric effect. Maybe I’ll dye my own to get the eye-searing blue I crave. When I showed Aaron the Gulfstream ball and explained it would be for socks, he asked if they would be socks to wear outside. Yes, Mr. Neutral Tones, socks to wear in public, thank you very much. I am somewhat amazed that I am getting so much knitting done. My graduate work is not progressing as well as I would like. I attribute this to the fact that I cannot write while nursing, but I can knit. That’s just how it’s going to be for a little while longer. You can imagine how disappointed I am about this, right? No horns! I tried the Pink Lemon Twist tutorial but I could not figure it out. I’m not really content with simply tacking those corners down when I weave in my ends as a solution to the problem. So, in the end, the horn-free toe was achieved by following Theresa’s advice about only going through the first and last stitches once. 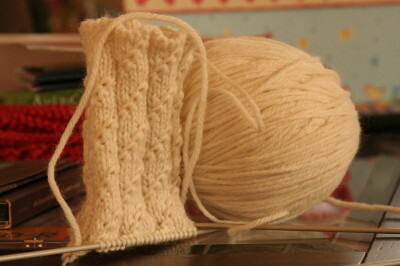 I’m quite happy with it although I have no intention of going back to re-graft the first sock. I can live with a slight imperfection! 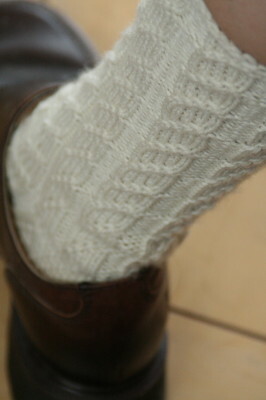 As for the rest of the sock, look how nicely the pattern comes out. I’m totally in love with it. I used an eye of partridge heel instead of the one suggested in the pattern because I prefer the lattice look. And now for the action shots… You can’t knit socks without trying them on in shoes, can you? Hey, there’s nothing as cool as white socks and black shoes, right? Just kidding – these shoes were closest at hand when I was taking pictures. In other knitting news, I’m trying out Norwegian Purl with Continental knitting. With NP, the yarn is held in back. This allegedly makes ribbing fly by. I’m intrigued. Do any of you knit and purl this way? Do you have any strong opinions about it? This will be a long term project for me because I’m so impatient and often switch back to English purl because it’s easier and faster right now. My goal is to get good enough at the Norwegian purl to abandon my old method. Finally, I have a Secret Pal update – check out the fuzzy baby yarn and pattern from my Secret Pal! 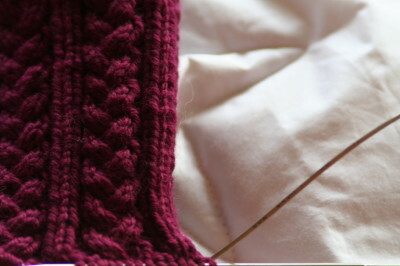 I’ll be returning to baby knitting soon – as soon as I get this sock knitting out of my system! 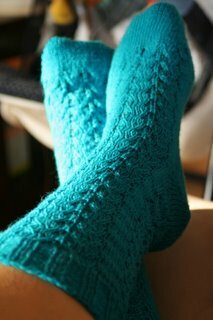 Thanks for your all of your comments on the Cable Twist Socks! I’m really smitten with them. I’ve finished the first one and I’m halfway down the leg of the second one. 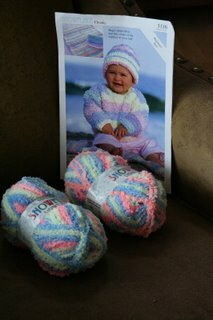 It knits so quickly because the pattern calls for worsted weight yarn. Even though I’m using US2 DPNs, it’s a fast knit! 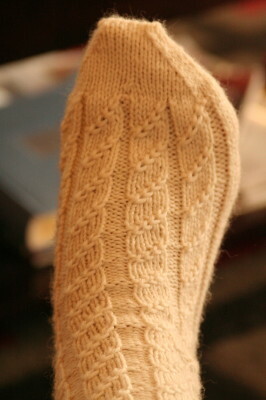 My only regret with this sock is the Kitchener grafting. I love the seamless look of the toe graft but I hate how I get points that stick out at either end of the toe. Do you see them? I’ve looked up tutorials and learned the setup steps to make it look cleaner but I still see a pronounced bump on each end. 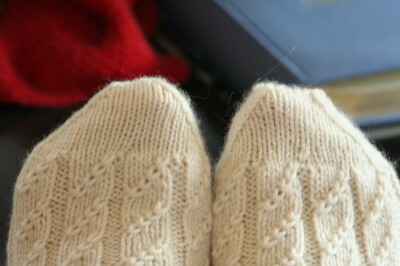 Do any of you master sock knitters out there have any suggestions on how to avoid the problem? 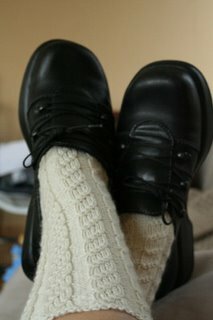 Now that I know how quickly these knit up, I want more pairs. *sigh* I have so many baby projects that I want to start but since B. is too small for many of her existing knits, I’m going to postpone the big baby knitting projects for now. So what next? 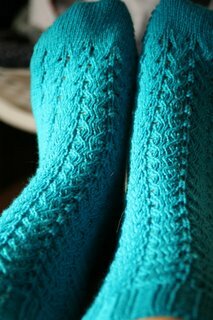 Another pair of cable twist socks? Or the Orchid Socks from craftaholic? Or the Hedera Socks from Knitty? Carin, my secret pal from SP8, gave me some Lang Jawool that I’d like to use soon – it’s calling me. So, I guess I’ll think about what comes next while I work away on the second Cable Twist sock. Much to my horror, I’m discovering that knitting is one of the only activities that I’m still able to do. I haven’t started back to running yet for a host of reasons. First of all, Beatrix can’t go in the jogging stroller until 4 months (another 5 weeks) because of the head support issue. The only other time I can really run (baby-free) is at 5 p.m. when Aaron gets home from work and that seems to be her fussiest time of day when nursing is the only thing that satisfies her. We walk all over town every day but walking just doesn’t clear my head the way running does. I keep assuring myself that this is a very temporary situation but it’s still hard to take.